"The Whole Foods Cookbook" is available for purchase in stores now. Pick one up at your local Whole Foods Market. 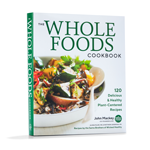 John Mackey, Whole Foods Market’s CEO, has released his latest book, “The Whole Foods Cookbook.” This cookbook was created to inspire you to cook even more plant-centric meals at home. The book features more than 120 recipes, and we’re sharing some right now, just in time for your holiday meal. The sweetness of the potatoes perfectly complements this punchy green onion dressing. A great twist on a Thanksgiving tradition. Steam sweet potatoes in a covered steamer basket over gently simmering water until tender, 8 to 12 minutes. In a medium bowl, whisk together the vinegar, wine, mustard, green onion, tarragon, garlic and spice blend. Add the sweet potatoes and toss gently to coat. Garnish with parsley. Note: To crisp up the potatoes, line a baking sheet with parchment and spread the dressed potatoes on the sheet. Broil until crispy, about 10 minutes. Combine everything in a small airtight container, cover and shake well. Store at room temperature away from heat and light for up to 4 months.